Resident artist at Country Gallery. Traditional painter in oils of all subjects. Specialises in Commissioned work. With realistic, vibrant paintings perfectly capturing landscapes, animals, people and still life, Derek Shapiro’s fine artwork is truly breathtaking. With an obsession for realism, his stunning creations have the detail of a photograph and the soul of a painting, with an eye for detail so true to life it’s easy to see why his successful painting career has spanned an incredible 35 years. But surprisingly, Derek was denied a place at Art College when he left school. With no formal qualifications to his name, he spent years doing various jobs, including a stint in the rag trade working for master tailors. But although he enjoyed it, this was not the type of work he was inspired by and eventually Derek went in search of pastures new. It was not until he was 28 years of age that he got back into the art world, after spotting an advert in the local paper; he ended up working at the world-renowned Wedgwood group, in the prestige department of Coalport China where he trained to paint on fine bone china. 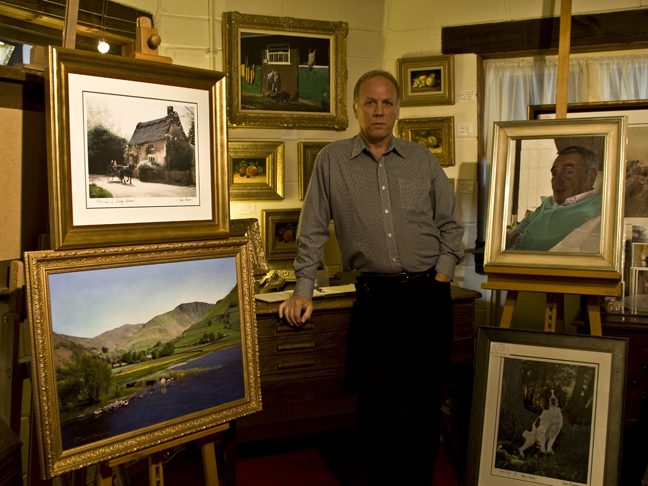 Derek, has a working gallery at Slater’s Craft Village, in North Staffordshire, which he has had for the past 16 years, as well as a small gallery in his home village of Woore, situated in Shropshire on the borders of the three Counties of Cheshire, Shropshire and Staffordshire. He explained: “I wasted my time at school, I was not really interested in it, and because Art College required O-Levels which I didn’t have, I never got in. “I remember working for a week solid before my interview at Coalport in an effort to put together a portfolio of work, which at the time I also didn’t have! Derek started as a freehand artist, painting on fine bone china for the gift ware market, eventually working on historic editions and prototypes. When he was made redundant in 1979, he was determined not to be deterred and he set about creating freelance artwork to sell and within a few years decided to switch to oil painting. Completely self-taught in oil painting, Derek now spends his time creating visually stunning pieces in oil on canvas. His obsession and attention to detail is evident in the works he produces today and cover an eclectic mix of subject matter, which is quite a rarity in itself, for an artist to jump from one subject to another. His aim is to work without compromise to achieve the space and depth no matter the subject which give his work the substance he strives for. He continued: “ the way I achieve the end result I’m looking for is by working on several paintings at the same time, so whilst I’m waiting for paint to dry I’ll switch to another canvas, and because my paintings take a long time to do I can return to each painting with fresh eyes. Another reason is my attention span is low and I get bored painting the same things – it keeps things interesting doing different things. Besides, I’d hate to be labelled as the artist who paints stick figures! In the past he has exhibited in various galleries in the UK and the Netherlands and been accepted by the Society of Marine Artists in the Mall Galleries as well as holding solo exhibitions at Tatton Park, Weston Hall the N.E.C. and even the South African Embassy and has plenty of exciting projects on the horizon. Derek specialises in commissioned work and also offers a full restoration service of Period and old oil and water-colour paintings.